We’d been told about the new motorway from Dublin to Galway, but I don’t think either of us actually believed that it would only take us two hours to cross Ireland from East to West. In fact, it was an extremely pleasant drive, and yes, we were navigating the (many) roundabouts on the outskirts of Galway city an easy two hours after leaving Dublin. (The fact that it took us 45 minutes to get out of Dublin because of my woeful navigation notwithstanding). Still jet-lagged, our boys slept soundly almost all the way. This was good and bad. Good, because we had a peaceful drive, and bad because even though the drive to Galway city was short, we still had at least another hour to go and we knew that it would be important to get our kids outside and running around if we were to have any hope of a decent night’s sleep that night. 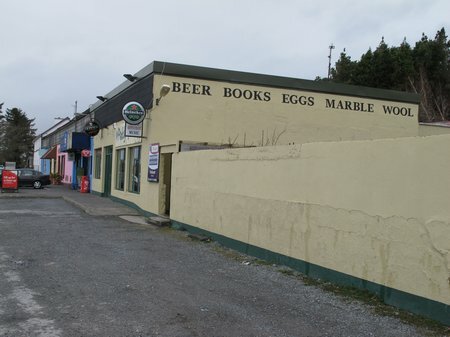 On the road to Clifden, it seemed that Galway city stretched out much further than I remembered and I wondered if my quest to go to Connemara to be off the beaten path in Ireland was ill-conceived. My fears quickly dissipated as we left Oughterard and instead I was rendered speechless by the scenery. The boys were awake by the time we drove into Recess so they spotted this gable-end sign and howled in disbelief. Of course we had to stop and take a photo! Tiny though it is, there were plenty of fun and funny photo opportunities in Recess. Photos taken, we decided to stop in Clifden for lunch before continuing on to Renvyle. This turned out to be a perfect choice. The lunch crowd at E.J. King’s on the Square in Clifden was just thinning as we arrived for our first pub lunch of the trip. 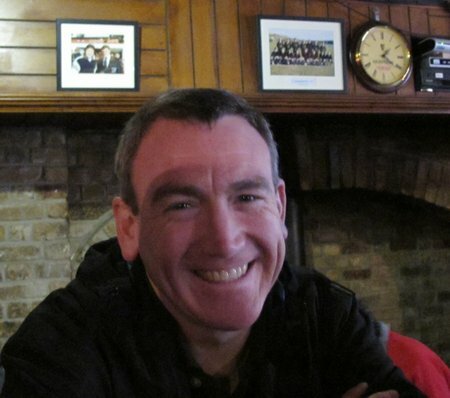 As we waited for our food (smoked salmon, fresh homemade brown bread and Guinness), CAM took this photo of his Dad – which he titled “An Irishman Happy In His Natural Environment”. Even though the wind was blowing steadily when we left the pub, a brisk walk down to the harbor seemed like a good idea. As we started down the hill out of town, I noticed a cheery yellow “Sli na Slainte” (schlee na schlawnte) sign. I’d read the words aloud almost as if to remind myself that I could do so not really paying attention to BigB at my side. He thought the words sounded hilarious. With a serious Mommy voice, I tried to explain that the phrase meant Path to Health but he was off, racing down the hill repeating his new catchphrase over and over as he ran, accenting the words differently and playing with the sounds to his heart’s content. By the time we were on our way back from the harbor, the wind had really picked up and it was starting to rain. Normally, I’d expect my boys to be complaining in full voice at being outside in such weather but whether it was the giddiness of jet-lag or just the enjoyment of being on vacation, they were in high spirits. CAM turned around to face me and discovered in so doing that the wind blew out his jacket and almost swept him into the water. Naturally then they both had to try to hold their ground against nature. Within an hour we were all checked into the Renvyle House Hotel, our home for the next three nights. 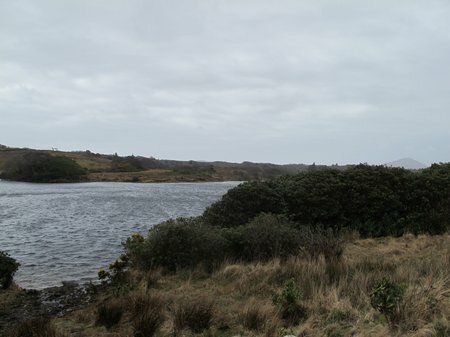 It had been a short, but fun, first day of our vacation-within-a-vacation in Connemara. We were invited to stay at the Renvyle House Hotel by the management in order to review the property for CiaoBambino.com. 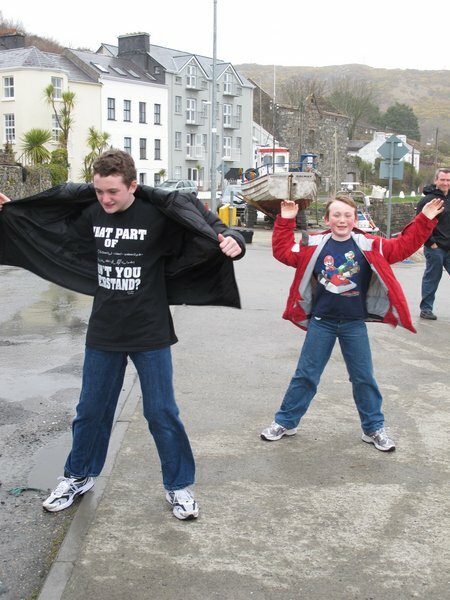 This entry was posted in International Escapades, Ireland and tagged Clifden, Connemara, Ireland, Recess on May 4, 2010 by wandermom. I love Clifden!!! I stayed at the Abbeyglen Hotel with my folks on a lovely trip in 1984. Wonderful memories, thanks for the reminder. My Dad passed away just after we returned home. This sounds like it was really fun!